Dead white men rule the roost at South African and British universities. They preside over open spaces and lecture halls. They clog up reading lists and dominate the syllabus, particularly in subjects like philosophy and English literature. In eight years of university teaching in the United Kingdom and South Africa, I have had to cover works by Malory, Shakespeare, Tennyson, Eliot, Sophocles, Ovid, Homer, Beckett, Joyce, Hopkins, Heaney, Anouilh and … more Shakespeare. In all that time, I’ve been required to teach literary texts by just three women, also dead and white: Sappho, Virginia Woolf and Jane Austen. Outside of the courses I have designed myself, only one person of colour – Naguib Mahfouz – has featured in my required teaching. Academics can suggest additional texts and offer optional modules but not all students will delve deeper in their own time or explore authors not included on the required reading list. In South Africa and the UK, students who want diverse, transformative education are growing increasingly restive. Their first target was not an author or theorist, but an entirely different sort of dead white man. 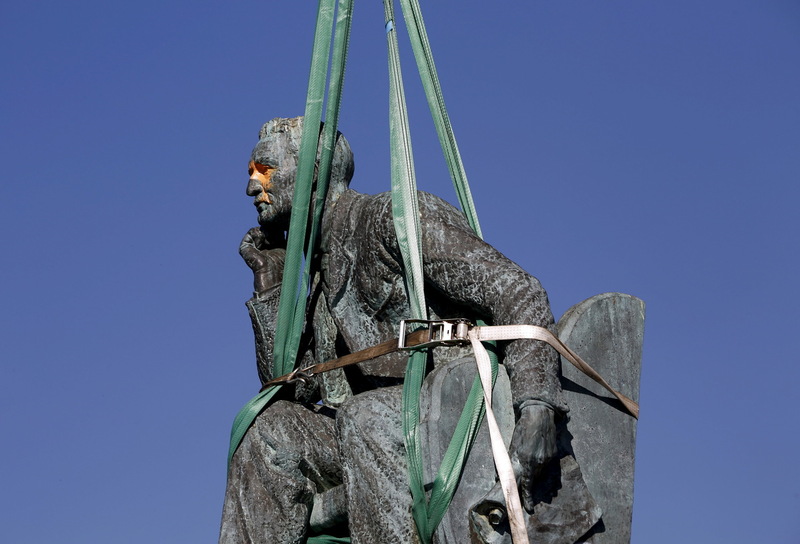 For 81 years, a statue honouring British mining magnate, politician and committed colonialist Cecil John Rhodes occupied a perch on the University of Cape Town’s (UCT) campus. But on March 9 this year the statue’s silent contemplation was interrupted when 30-year-old student Chumani Maxwele threw a bucket of human faeces over the statue and sparked a movement, #RhodesMustFall. I hold that the natives should be apart from white men, and not mixed up with them … We fail utterly when we put natives on an equality with ourselves. UCT students, staff and alumni argued that a man like Rhodes did not deserve a monument at one of Africa’s top universities. The statue, they insisted, was a physical reminder of just how little the institution had changed from the days when it only served white students. Their complaints struck a national chord. One month after Maxwele’s pungent protest, Cecil John Rhodes was evicted from UCT. 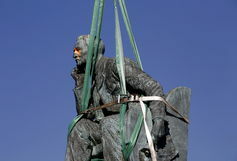 A statue of Cecil John Rhodes is removed from the University of Cape Town’s campus in April. Students in the UK are also questioning the lack of diversity in higher education. They are asking: “why isn’t my professor black?” and “why is my curriculum white?”. These are not new questions. Calls for transformation are as much a hallmark of higher education as it is a resistance to change. But in the era of social media, student activists are armed with more efficient and powerful tools than ever before. The message to universities, carried on platforms like YouTube, Tumblr, Facebook and Twitter, is clear: engage with these issues – or get left behind. A panel discussion hosted by the University College of London. The Rhodes monument seems an apt metaphor for the looming presence of certain authors, texts and narratives in the humanities and social sciences. The problem is that they are not as easily dislodged as statues. If we want to build on what movements like #RhodesMustFall have achieved and really decolonise universities, it’s time for dead white men to stop controlling things. Altering the curriculum is a necessary part of this change. That doesn’t mean Shakespeare should pack his bags and leave universities once and for all. It simply requires a different way of teaching – and here’s how it can be done. Academics and their students must engage with English being a language born of and sustained by migration and cross-cultural contact both in Britain and overseas. This narrative must be a central part of the curriculum, from the very beginning of the literary studies degree. We must acknowledge the power structures that have allowed some people to contribute to the canon while keeping others out. These structures have also preserved certain texts while ignoring others. We must also explain the role universities have played in this selection process. It’s time to eradicate the notion that writing by women, people of colour and other socially and culturally excluded groups is only interesting to a limited number of people. Being familiar with these voices is essential to the kinds of skills cultivated by and assessed in a literary studies degree. It is not an optional extra. Teachers must be retaught. We tend to reproduce the narratives we absorbed as students, so an ongoing process of research and sharing is crucial if we are to teach differently. The Sheffield SEED project is tackling this issue well. “Race” and “gender” do not just mean blackness and womanhood. There must be space in the core undergraduate curriculum for analyses of whiteness and masculinity, too. Rachel van Duyvenbode’s White Like Me: Reading Whiteness in American Literature MA module at the University of Sheffield is a useful template that can be adapted at undergraduate level. Students must have opportunities to produce original research and pursue their own concerns and interests from the outset of their literary studies degree. The University of Sheffield again leads the pack here through its Radical Theory module. This asks students to actively engage in “re-interpret[ing] the university as a site for philosophical speculation and theory-based intervention” through independent projects and peer-to-peer learning. Creative writing can give students – and teachers – a chance to imagine the voices that are ignored in our existing curricula. A possible starting point might be the responses of the Africans who, in 1607, witnessed the first recorded performance of Hamlet: on a ship off the coast of Sierra Leone. It will take more than a month-long campaign sparked by a bucket of waste to transform higher education in South Africa and the UK. In the short term, at least, there will be no empty plinths. Changing the curriculum is just one of many things that needs to be done – but it’s an important start. By allowing different voices to step up to the lecture podium, we can begin to push dead white men like William Shakespeare out of the limelight and ultimately produce a curriculum that better reflects the diversity of English literature and culture both past and present.